I’ve recently discovered the enjoyment of the journey. Normally, getting from one place to the next, like from the bus stop back home, is about functionality, the necessity of moving from one space to another. I’m often listening to music or checking my phone, composing work emails in my head or thinking about what to cook for dinner. Not paying much attention to what is going on outside of me. Lately, though, W is just full of curiosity. Her favourite game is to point at the sky, a bird flying overhead, a car, a tree, all with a sweet questioning sound, prompting me to pay attention so that I can talk to her about the world around us. She is also full of beans, and more often than not on the way back from a walk to the shops or the park, she’ll start wriggling and decide she wants to get down and walk. Suddenly a five minute trip home becomes a twenty minute amble as we stop to play with some bright red berries growing on a bush on the nature strip, lean against a sun-warmed rock, pick up some smooth strangely-shaped sticks from the gutter, or back track to examine a particularly interesting collection of stones. At first I would get impatient and pick W up to hurry us along. But then I realised that we are usually in no rush, so what is the harm in taking our time to explore? Her sense of wonder reminds me strongly of how I feel when traveling, of having no place to be other than exactly where I am, where everything around me is new, where my normally brisk pace slows right down so I can take it all in. For a toddler, most everything is something new. It’s nice, I’ve discovered, to move through the world a little slower. To take notice of what surrounds the places where we live and work and play, to pay attention to what changes and what stays the same from day to day. A child’s pace can be frustrating at times, but I don’t want to teach W to hurry through life without taking notice. So I take a deep breath, hold her warm little hand, and together we discover the adventures to be had on the way back home. Similarly, our Saturday morning market trips have become more leisurely. As we strolled through the market this weekend past I picked up a bag of baby brussels sprouts. They were so damn cute I just had to have ’em, although I had no plan in mind. For a while I was thinking of shredding them raw with some carrot and kale, and sprinkling the lot with a lemony dressing and some crushed peanuts (which still sounds pretty tasty!). 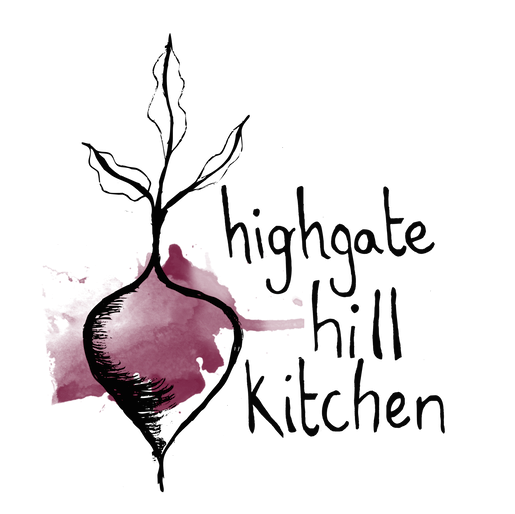 But in the end with these cooler days I wanted a warm salad, something hearty with lots of flavour. 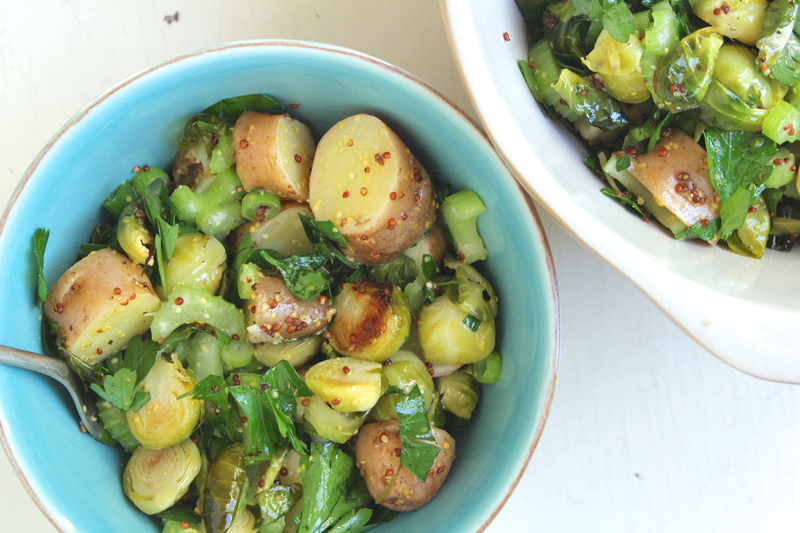 And so this Potato & Brussels Sprouts Salad was born. This salad is – if I may say so myself – delicious. It is lighter than the average mayo-drowned potato salad, has greens and crunch from the celery and parsley, and a nice mustardy kick. We ate it warm for lunch on Sunday afternoon topped with a boiled egg to round out the meal with some protein, and the leftovers were equally delicious cold the next day. 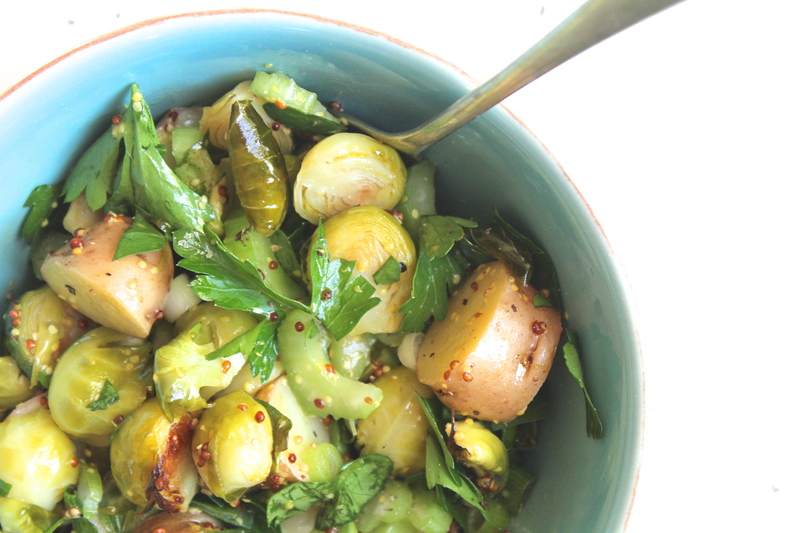 This is a perfect side salad, and would also make an excellent barbeque contribution. Basically, it is an all-rounder. Make it. Heat oven to 200°c. Trim the stems off the brussels sprouts and cut in half from stem to top. Oil a baking try and place the brussels sprouts in a single layer, cut side down. Roast for about 20 mins, until the sprouts are tender but not mushy, and the undersides are starting to brown. Set aside. Cut the potatoes into 2cm chunks and steam until just cooked through, about 20 minutes. Rinse under cool water and set aside. Thinly slice the celery sticks and the spring onions, and roughly chop the parsley. 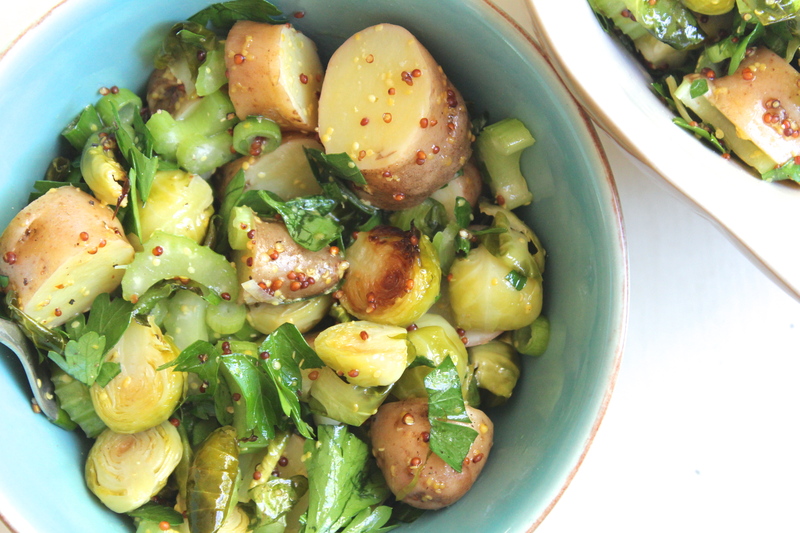 In a big bowl combine the sliced veges and parsley with the cooked brussels sprouts and potato. Prepare the dressing by whisking together the mustard, vinegar, olive oil, syrup, and salt to taste. Pour the dressing over the salad and mix to thoroughly combine. Enjoy warm immediately or pop it in the fridge and have it cold later on. 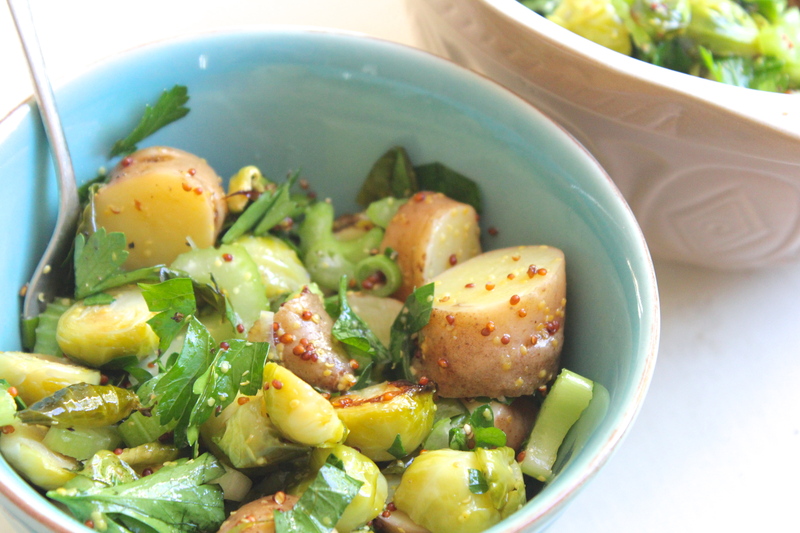 Notes: you can use any potatoes for this, but creamy fingerling potatoes have the best flavour. I used pink fir potatoes, but kipflers will work just as well. If you don’t have brown rice syrup (and you’re not vegan), then honey will also do the same job. 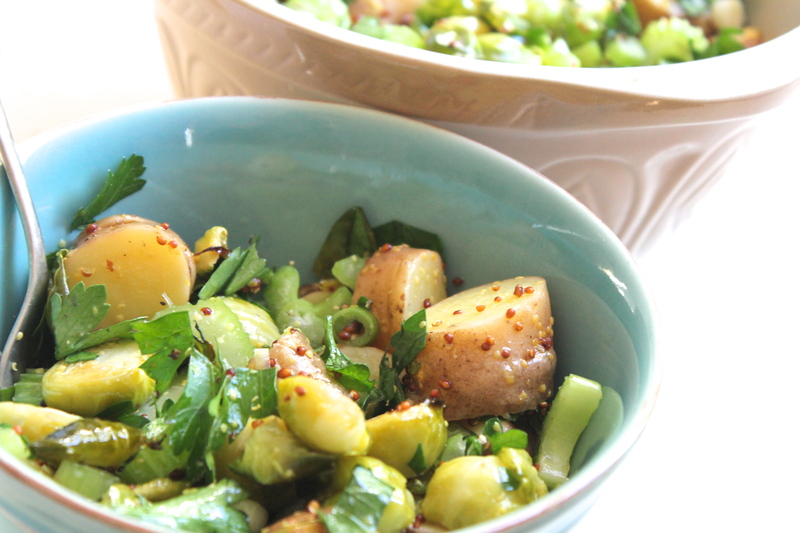 This salad is pretty sturdy and will keep well in the fridge for 3 – 4 days. I know, right?! Baby brussels sprouts! This salad does look delicious. I love your dressing too. 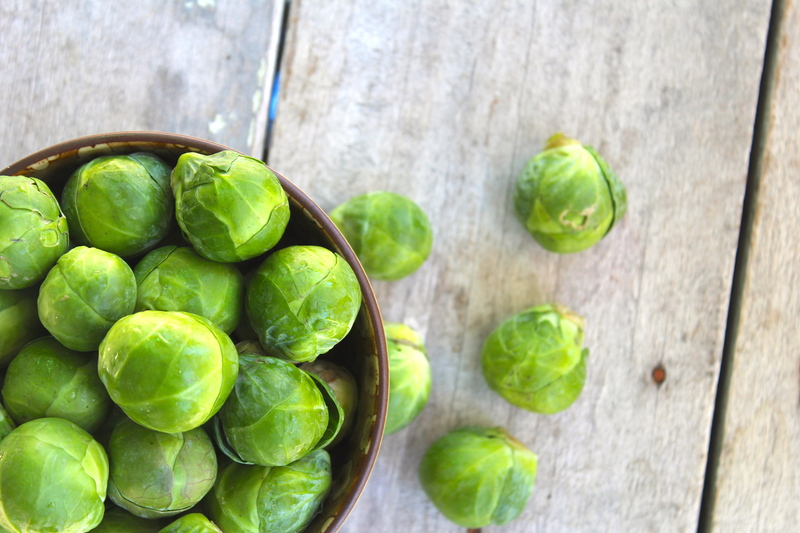 Bookmarking for when brussels sprouts are back in season for us! Thanks Katie. I’ve been bookmarking all the wonderful fresh berry recipes coming out of the northern hemisphere for she they come back in season here!